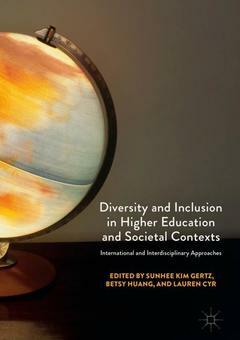 Groundbreaking in its international, interdisciplinary, and multi-professional approach to diversity and inclusion in higher education, this volume puts theory in conversation with practice, articulates problems, and suggests deep-structured strategies from multiple perspectives including performed art, education, dis/ability studies, institutional as well as government policy, health humanities, history, jurisprudence, psychology, race and ethnicity studies, and semiotic theory. The authors?originating from Austria, Germany, Luxembourg, Trinidad, Turkey, and the US? invite readers to join the conversation and sustain the work. SunHee Kim Gertz is Professor Emerita of English and Senior Research Scholar at Clark University, USA. Betsy Huang is Associate Professor of English and former (inaugural) Chief Officer of Diversity and Inclusion, Clark University, USA. Lauren Cyr is a PhD student at Clark University, USA.